The morning after returning from visiting family for Thanksgiving, I awoke with the thought, “The ball season has again returned, and already the ‘busy hum of preparation’ for its festivities may be noted on every hand.” (New York Times, November 20th, 1870). Well, perhaps I didn’t use those words exactly, but when I realized my first holiday party of the season was that night, I reconciled myself to the fact the holiday season was upon us in full force. While most of us may have a busier social calendar than usual between Thanksgiving and New Year’s, Gilded Age New Yorkers celebrated all the way through January and February, up until the the onset of Lent, which brought about the close of the winter season. During Lent, New Yorkers continued to entertain quietly, but large, ostentatious events were put on hold until the end of the religious observance. 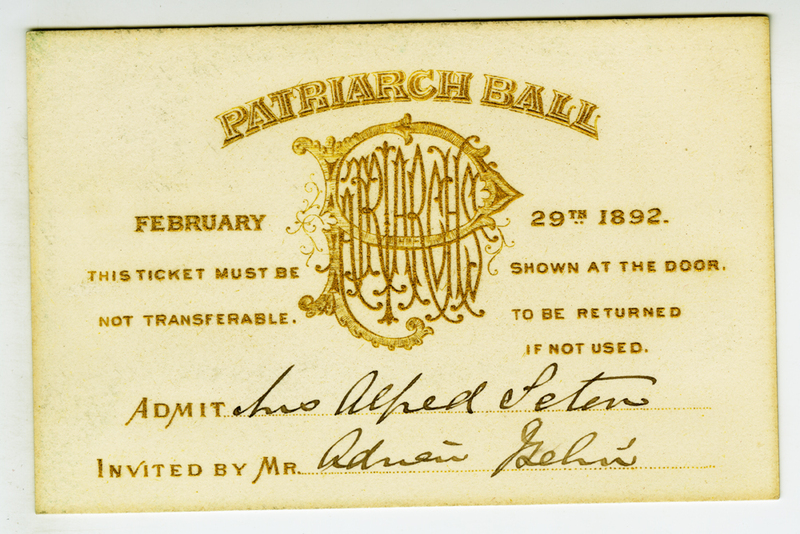 Invitation to the Patriarch Ball, February 29th, 1892, from the Collection on New York City Society. Museum of the City of New York. 83.20.2. 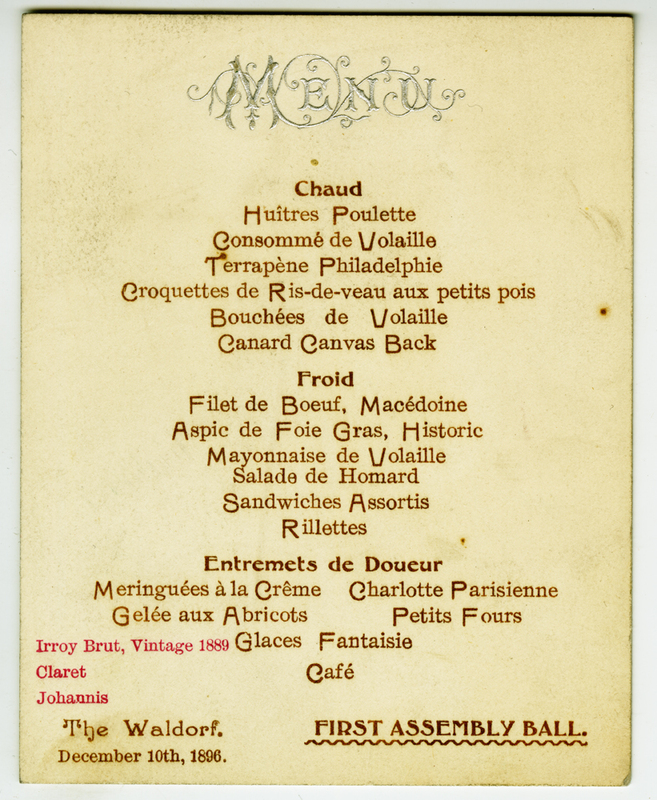 Menu for First Assembly Ball, December 10th, 1896, in the Collection on New York City Society. Museum of the City of New York. 47.229.2. The exclusive “Assembly Balls” were initiated in 1882, and were considered to represent the best and most brilliant of New York society. Originally, three Assembly Balls were given during every winter season, in December, January, and February. They were organized by a committee of 50 women, and each hostess was given nine invitations to send out as she saw fit. Original leaders included Mrs. John Jacob Astor, Mrs. August Belmont, Mrs. Paran Stevens, and Mrs. Hamilton Fish, and the events were held both at Delmonico’s and the Waldorf Hotel (and later the Waldorf-Astoria), over the years. While just as exclusive as the discontinued Patriarch Balls they replaced, the Assemblies were considered more fashionable. Some of the balls, while I am sure quite lovely, were essentially corporate parties or professional gatherings, such as the Matthew T. Brennan Coterie. The Matthew T. Brennan Association was a political club affiliated with Tammany Hall that honored one of its “oldest and most dedicated workers,” Matthew T. Brennan, who also served as a New York City Police Commissioner (New York Times, August 18, 1970). This November 20th, 1870, New York Times article presents a preview of the ball season, and mentions that members of the M. T. Brennan Association would each be assessed $25 to cover the expense of the ball, an equivalent of $450 in today’s dollars. That’s a pretty expensive party ticket. 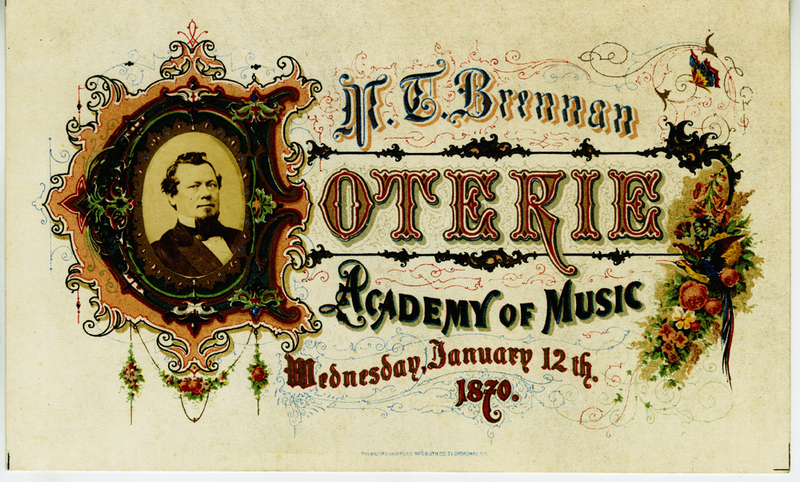 Admission ticket to the Matthew T. Brennan Coterie, January 12, 1870, in the Collection on New York City Society. Museum of the City of New York. 36.196.1. Another attraction of the holiday season was of course the fancy dress or masquerade ball. One of the most famous of such balls was the Vanderbilt Ball of 1883, already described in all its glory in one of our earlier posts. Gilded Age New Yorkers, however, had an insatiable appetite to dress up in fanciful costumes. The Grand Masquerade of the Prospect Association seems to have been a bit more of a raucous affair than the Patriarch or Assembly Balls. In 1886, the ball was excessively large, “if not select, and was composed of the juvenile element of the so-called gilded youth.” (New York Times, February 5, 1886) Due to the crowds, at 1 a.m. the Police enforced a halt to all wine sales outside of the supper room, to the great dismay of the attendees. One can just image those Patriarchs and Assembly hostesses groaning that there was clearly something behind an exclusive invite only party, and these ticketed events just got out of control. What were the “gilded youth” coming to? 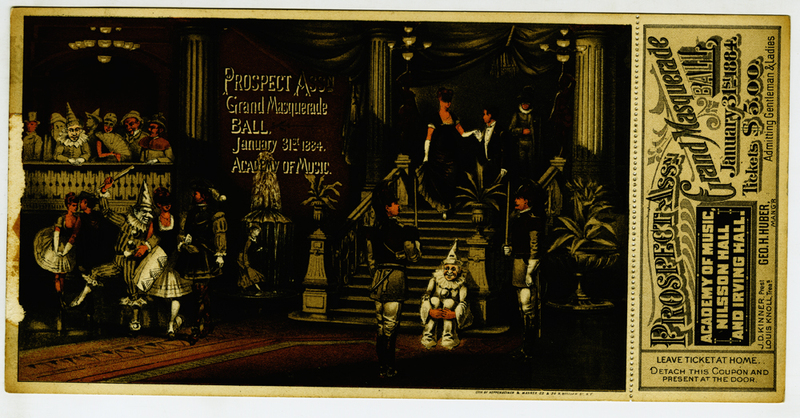 Admission ticket to the Prospect Association’s Grand Masquerade Ball, January 31st, 1884, in the Collection on New York City Society. Museum of the City of New York. 49.66.51. While I did not find any invitations in the City Museum’s collection directly related to Christmas balls, I did find some related to Hanukkah. 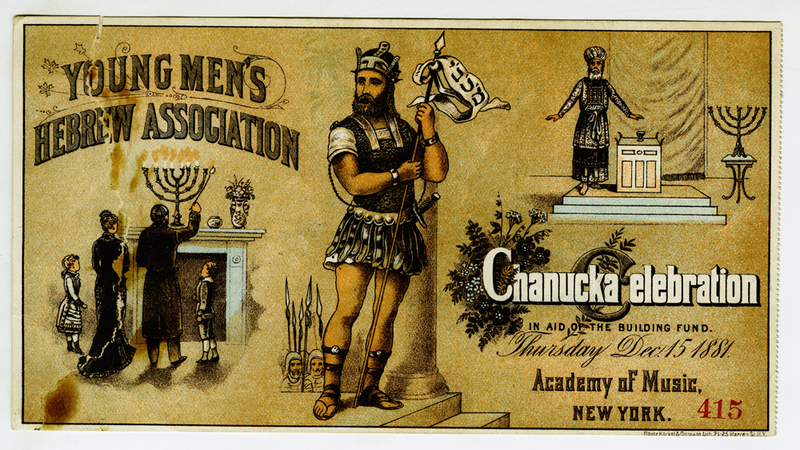 The Young Men’s Hebrew Association (now, along with the Young Women’s Hebrew Association, more commonly know as the 92nd Street Y) hosted its annual Chanucka Celebration at the Academy of Music throughout the 1870s and 1880s. While the New York Times reported on how crowded the event was, the Jewish holiday was still unfamiliar enough to the paper’s readers that several paragraphs were devoted to explaining the origins of the holiday, and how it was celebrated. Admission ticket to the Young Men’s Hebrew Association Chanucka Celebration, December 15, 1881, In the Collection on New York City Society. Museum of the City of New York. X328.1. To learn more about the famous balls of the Gilded Age, check out Susan Gail Johnson’s essay “Like a Glimpse of Old Versailles,” in Gilded New York: Design, Fashion, and Society, the companion text to the Museum’s exhibition. This entry was posted on December 17, 2013 by Lindsay Turley in Manuscripts and Ephemera and tagged 1800s, 1870s, 1880s, Balls, Celebrations, Costume balls, Ephemera, Gilded Age, Hannukah, Holidays, Invitations, Winter season.